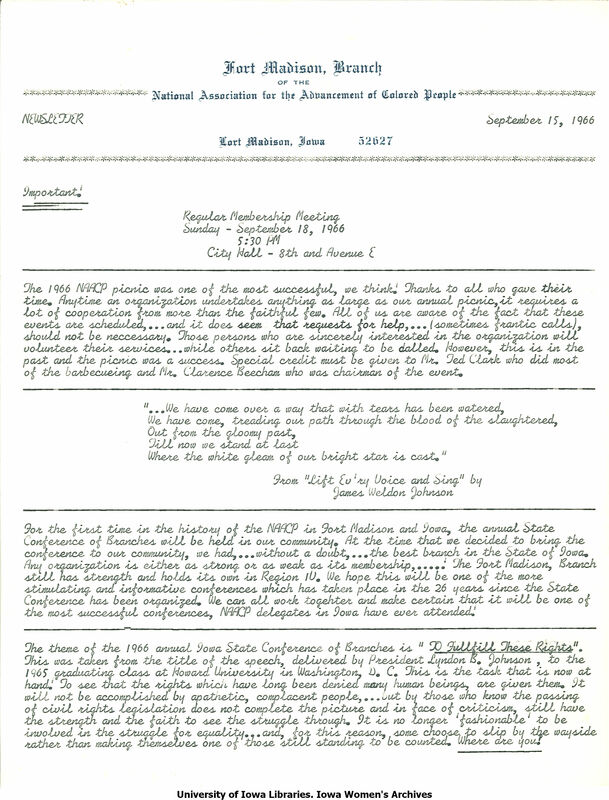 Fort Madison Branch OF THE National Association for the Advancement of Colored People NEWSLETTER, September 15, 1966 Fort Madison, Iowa 52627 Important 1 Regular Membership Meeting Sunday - September 18, 1966 5:30 PM City Hall - 8th and Avenue E The 1966 NAACP picnic as one of the most successful, we think! Thanks to all who gave their time. Anytime an organization undertakes anything as large as our annual picnic it requires a lot of cooperation from more than the faithful few. All of us are aware of the fact that these events are scheduled, ... and it does seem that requests for help,.. (sometimes frantic calls). should not be necessary. Those persons who are sincerely interested in the organization will volunteer their services.. while others sit back waiting to be called. However,l this is in the past and the picnic was a success. Special credit must be given to Mr. Ted Clark who did most of the barbecueing and Mr. Clarence Beecham who was chairman of the event. "...We have come over a way that with tears has been watered. We have come, treading our path through the blood of the slaughtered, Out from the gloomy past Till now we stand at last Where the white gleam of our bright star is cast." From "Lift Ev'ry Voice and Sing" by James Weldon Johnson For the first time in the history of the NAACP in Fort Madison and Iowa, the annual State Conference of Branches will be held in our community. At the time that we decided to bring the conference to our community, we had,... without a doubt... the best branch in the State of Iowa. Any organization is either as strong or as weak as its membership.... The Fort Madison, Branch still has strength and holds its own in Region IV. We hope this will be one of the more stimulating and informative conferences which has taken place in the 26 years since the State Conference has been organized. We can all work together and make certain that it will be one of the most successful conferences, NAACP delegates in Iowa have ever attended" The theme of the 1966 annual Iowa State Conference of Branches is " To Fulfill These rights " This was taken from the title of the speech, delivered by President Lyndon B. Johnson, to the 1965 graduating class at Howard University in Washington D.C. THis is the task that is now at hand. To see that the rights which have long been denied many human beings, are given them. It will not be accomplished by apathetic, complacent people.. but by those who know the passing of civil rights legislation does not complete the picture and in face of criticism, still have the strength and the faith to see the struggle through. It is no longer fashionable to be involved in the struggle for equality... and for this reason, some choose to slip by the wayside rather than making themselves one of those still standing to be counted. Where are you? University of Iowa Libraries. Iowa Women's Archives.